Heineken is easily one of the most iconic beer brands in the world – but how much do you know about the beer and the company that brews the stuff? The Dutch lager with the lone red star on a green bottle can be something of an enigma. Thankfully, we’ve researched these 10 facts about Heineken that you can rattle off to your mates next time you enjoy a bottle or glass of the world-famous beer. Of course, it should surprise no-one that Heineken is a huge multinational beer brand, considering its beer is almost as omnipresent as Coca-Cola. However, it’s only when you actual travel to some of the world’s most remote corners that it really dawns on you just how popular this beer is. It started in the Dutch capital of Amsterdam, but these days Heineken is brewed by more than 140 different breweries around the world. Chances are you’re not reading this article in Amsterdam, so the last Heineken you probably had was brewed domestically. Heineken’s revenue in 2013 was €19.2bn ($21.8bn USD). That’s a lot of beer. To put it in perspective, that figure is higher than the GDP of many of the world’s smaller countries – including Jamaica, Cambodia, and Albania. That’s right. Depending on what you read, Heineken International is only the second or even the third largest brewer globally by revenue. Anheuser-Busch InBev is the undisputed champion, accounting for a 25% market share of all the sales of beer worldwide. These brands include Amstel, Desperados, Sol, Strongbow cider, Dos Equis, Tiger, and Bintang. You’ll notice that many of the Heineken International beer brands are relatively dull-but-highly-marketable light lagers. 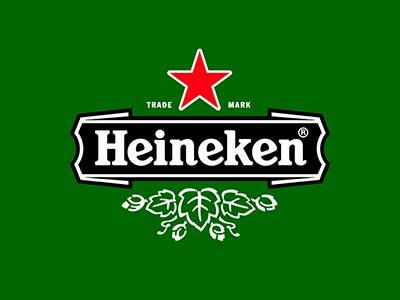 Heineken was founded in 1864 by one Gerard Adriaan Heineken. We’ll guess that even he couldn’t predict how successful his beer would turn out to be just 150 years later. But it’s no longer operational. The original brewery on Stadhouderskade and Ferdinand Bolstraat was closed in 1988 and was later reopened as the Heineken Experience – an interactive museum and corporate visitor centre. Alfred Henry Heineken, the grandson of original founder Gerard Adriaan Heineken, is the man behind the Heineken beer label. Legend has it that in 1964 he decided to change the font on the Heineken beer label so that it would be ‘more friendly’ to women, who at that point in history tended to be the ones buying groceries for the family. To this end, he subtly changed the font on the label so that the E’s appear to be smiling. It contains no animal products. However, there is 3.5g of sugar and 40 calories in every 100ml of Heineken beer. It’s not gluten free. Heineken typically contains a small amount of gluten that’s derived from the grain used to brew it. While researching this article Best Beer HQ stumbled across a statement on one of the Heineken websites condemning a nightclub in Mongolia that was hosting dog fights. Apparently images have been circulating online via social media with Heineken branding in the background. So Heineken doesn’t sponsor dog fights – just the UEFA Champions League, the Heineken Cup, the Heineken Open in New Zealand, numerous music festivals, the James Bond films and who knows how many other events around the world. Read more about Heineken here.